The Feiss Pickering Lane heritage bronze wall light with storm glass shade features a tall shade and candle effect light for the chic farmhouse look. 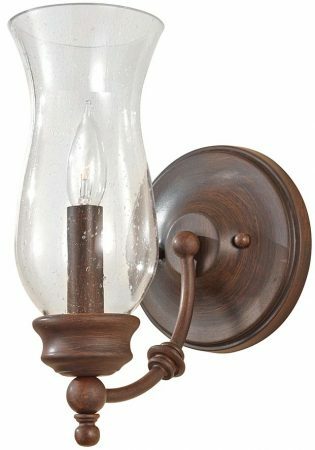 A country living style wall lamp, with a circular wall bracket and curved arm finished in heritage bronze. The lamp has a turned bobeche, supporting an inner candle tube and outer storm glass shade. The Pickering Lane collection is heavily influenced by the country farmhouse look of Northern Europe taken from the early 1900’s. With the storm glass look and tall candle effect, these country living feel fittings are supplied in a heritage bronze finish. The Pickering Lane heritage bronze wall light, with storm glass shade, designed in the USA by Feiss, founded in New York in 1955. They have become well known over the years for their contemporary yet classic styling, quality and great original designs. Feiss continue to maintain the highest standards in materials and workmanship to this day.